Palestinian amora of the third century; a pupil of Simeon b. Pazzi, whose sayings he transmits. 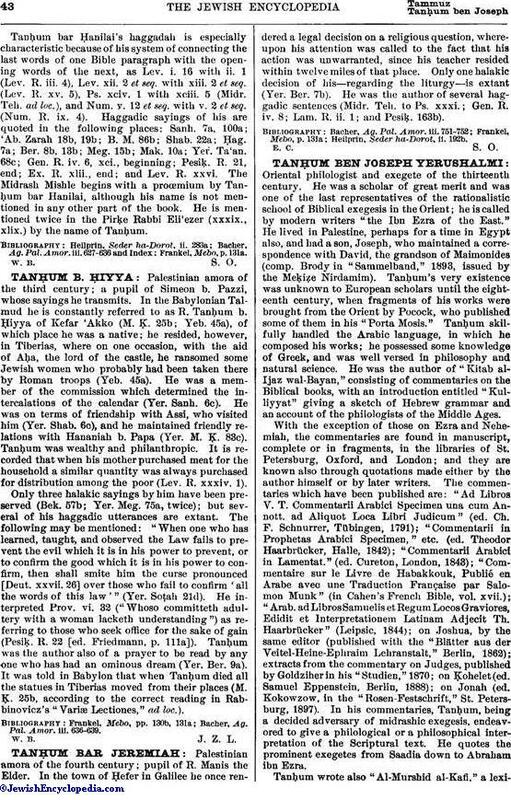 In the Babylonian Talmud he is constantly referred to as R. Tanḥum b. Ḥiyya of Kefar 'Akko (M. Ḳ. 25b; Yeb. 45a), of which place he was a native; he resided, however, in Tiberias, where on one occasion, with the aid of Aḥa, the lord of the castle, he ransomed some Jewish women who probably had been taken there by Roman troops (Yeb. 45a). He was a member of the commission which determined the intercalations of the calendar (Yer. Sanh. 6c). He was on terms of friendship with Assi, who visited him (Yer. Shab. 6c), and he maintained friendly relations with Hananiah b. Papa (Yer. M. Ḳ. 83c). Tanḥum was wealthy and philanthropic. It is recorded that when his mother purchased meat for the household a similar quantity was always purchased for distribution among the poor (Lev. R. xxxiv. 1). Only three halakic sayings by him have been preserved (Bek. 57b; Yer. Meg. 75a, twice); but several of his haggadic utterances are extant. The following may be mentioned: "When one who has learned, taught, and observed the Law fails to prevent the evil which it is in his power to prevent, or to confirm the good which it is in his power to confirm, then shall smite him the curse pronounced [Deut. xxvii. 26] over those who fail to confirm 'all the words of this law'" (Yer. Soṭah 21d). He interpreted Prov. vi. 32 ("Whoso committeth adultery with a woman lacketh understanding") as referring to those who seek office for the sake of gain (Pesiḳ. R. 22 [ed. Friedmann, p. 111a]). Tanḥum was the author also of a prayer to be read by any one who has had an ominous dream (Yer. Ber. 9a). It was told in Babylon that when Tanḥum died all the statues in Tiberias moved from their places (M. Ḳ. 25b, according to the correct reading in Rabbinovicz's "Variæ Lectiones," ad loc.). Bacher, Ag. Pal. Amor. iii. 636-639.